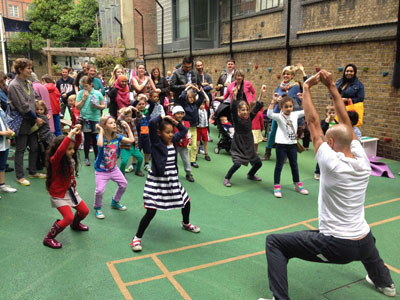 As part of our continuing outreach work in the local community, staff from Jubilee Hall recently supported a local Covent Garden primary school fair with fitness testing, healthy eating advice and a hip hop class! Teachers, staff, parents and children enjoyed this annual event , despite the rain interruptions! Remy’s dance class was a great success although the definite highlight of the day was the fly-past by RAF planes heading for Horseguards Parade and the Trooping of the Colour ceremony! Not every school fair can boast that!